I’ll blame it on the English language: the title of this blog could mean different things. What it’s meant to mean is that I don’t finish paintings anymore, I keep working on them indefinitely. After 34 years of furiously painting new paintings and producing probably a thousand paintings or more, I slowed down in 2016 and 2017. That was partly to write my book, and the book is now available on this website. But it was also to curate the paintings I painted in the past. Many of these were from the pre-digital era. Back in the day, I would take my painting in to a photographer and get a transparency. Then a printers would use filters to separate the colors in the transparency and reproduce them in an offset litho print. Often this process would go well. Often it wouldn’t. Some paintings lost their mojo in the process. Then digital came along. Not only was the process of bringing prints out completely changed, the public became completely changed. Nowadays, by pressing the autocolor button in Photoshop, any image becomes more or less perfectly color-balanced and we all expect that in not only a print, but in any reproduced image we see anywhere. The narrow color ranges that used to emerge from the printing process all look dated now. What’s more, Photoshop and other software packages allow us to keep painting a painting on the computer after the painting is sold, or otherwise lost to the artist. In paintings of the type I do, there is often an object in front of the sky. In painting, it’s almost impossible to keep the sky bright and free of the colors used to create the object. In Photoshop it takes a few minutes sometimes. Is this ethical? Leonardo couldn’t do this when he painted the Mona Lisa. 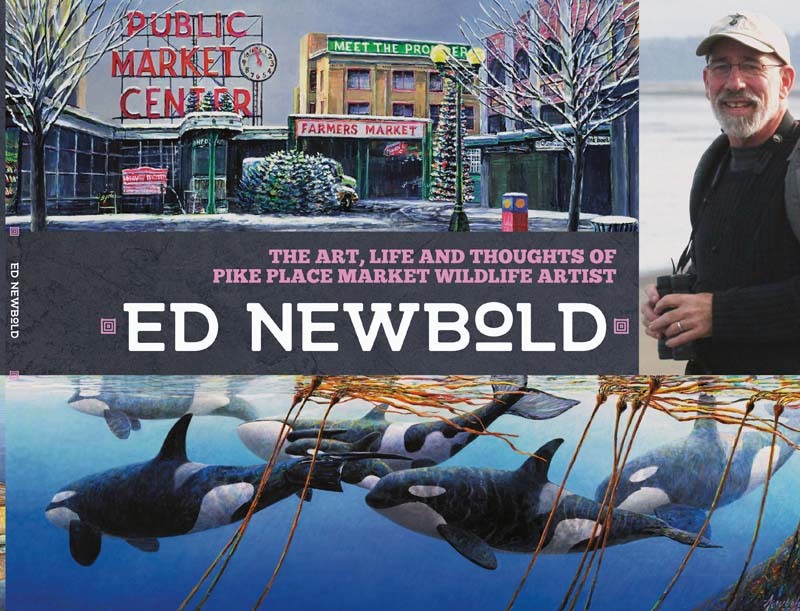 Should Ed Newbold refrain from doing it out of respect for this great artist and others who came before? Of course not. These artists where early adopters of technology. Caravaggio and Van Eyck and Holbein and others were pioneers of using lenses. They all got the best capital equipment such as paints, paint brushes and substrates that they could afford. The upshot is that I’ve been curating past work as much as starting new work over the last couple years. A couple examples are shown. I become enamored of some of my paintings sometimes, that’s not always good because sometimes my own likes and dislikes are way out of sync with others. But sometimes it’s a good thing. 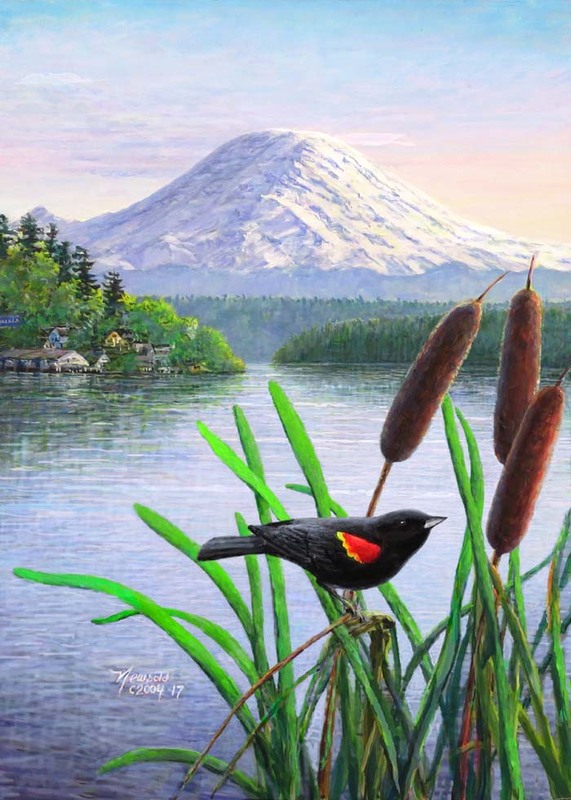 Right now I’m especially thrilled about Redwing and Rainier, shown on this blog and originally painted in 2004. I painted on it extensively with acrylics this summer and then worked it hard in Photoshop. I’m often disabused of such love over time, but I’m very eager to get a 12 x 16 image of this painting into the store, which should happen tomorrow. I’m calling it my best painting ever. Ask me how that went for me later. I’m also really excited to get a new version of Rounding the Point out, and I plan to replace the sign over the store, which uses Showboating as a background, with a more vibrant version of that painting.